M. E. Gwinn, a 60 year-old resident of Meadow Creek, succumbed this morning at 4:00 o"clock in the Hinton Hospital, following an illness of several weeks. Mr. Gwinn is widely known throughout the Meadow Creek section, where he has resided his entire life. Funeral services will be held Sunday afternoon at 2:00 o"clock at the residence. Burial will be made in the Meadow Creek Cemetery. Survivors include two brothers, Marshall and E. G. Gwinn, and one sister, Miss Mary Gwinn, all of Meadow Creek. 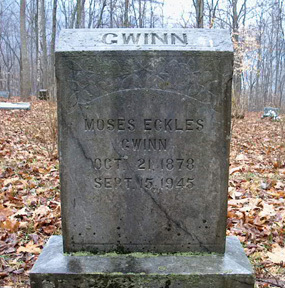 Mr Gwinn is and uncle of Mrs. E. B. Fox, of Summers Street, and the late C. N. Gwinn, of this city.